Information: Parker Pages is published quarterly (February, May, August and November) by the Parker Gun Collectors Association, with editorial offices at 78 River Street, Andover, MA 01810. Parker Pages is sent to all current members of the PGCA. Parker Pages publishes articles and opinions of contributors as a benefit of membership to make public the information resulting from those studies. Parker Pages solicits articles for publication that further this purpose. The views expressed by authors of these articles do not necessarily reflect those of the PGCA, and are published as representative of the author's opinion. Comments, suggestions, and criticisms that will improve this publication are welcome and should be sent to the editor. Advertisements for Parker Guns and related items from PGCA members will be published free of charge in the “Parker Marketplace”. Submission of Articles: Articles, letters, photographs and Parker related news for publication in Parker Pages should be sent to the editor in a manner that will be received by the closing dates listed. Classified ads must be sent by mail or e-mail to reach the editor prior to the closing dates, and will appear once, unless the editor is notified to re-run them. Questions relative to Parker Guns, or the PGCA will be forwarded to The Research Committee, The Parker Historian or the Chairman of a PGCA Committee for response. Suggestions for Contributors: "Click here" to read detailed suggestions for best results when submitting articles to Parker Pages. Parker Pages Advertising: "Click here" for information about arranging advertising and Parker Pages advertising rates. Past Parker Pages Index: "Click here" for the index to past issues of Parker Pages. Parker Pages Back Issues: Back issues may be purchased in the "Parker Store" found on this web site (see link on www.parkerguns.org). 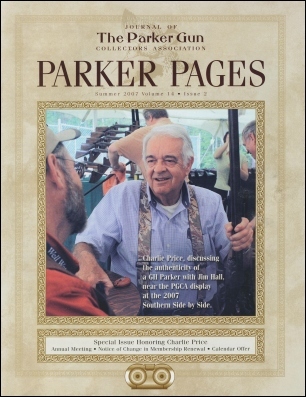 Parker Pages does not provide appraisals of, or authenticate any, Parker gun. Publication of pictures of a Parker gun, or a description of a Parker gun in Parker Pages does not imply verification of the authenticity of that gun. Don't get Parker Pages? Click here to join PGCA today! Cover: Charlie Price, discussing the authenticity of a GH Parker with Jim Hall, near the PGCA display at the 2007 Southern Side by Side. The First Parker with Selective Automatic Ejectors? If you would like to read this issue of Parker Pages simply "click" on the cover above. Be aware that you will need Acrobat Reader to view it and that the file is large and could take several minutes to download. If you have never read Parker Pages you need to check out this issue and see what you are missing.